Latvian government has supported Environment Protection and Regional Development Ministry’s prepared report ‘On maintenance of used tires’. This report includes proposals for measures to help resolve the matter regarding speeding up recycling and regeneration rates, as well as the no less important matter of maintenance of used tires. 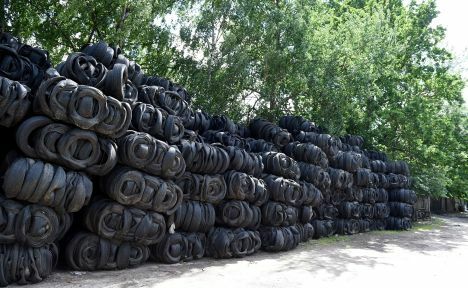 To improve the used tires maintenance system, as well as liquidate existing pollution caused by growing stockpiles of used tires, officials will also look into the possibility of adding a «zero tire declaration» – a system in which legal and private persons would be able to hand over used tires to waste management companies at no extra cost. Introduction of this system would also help reduce the volume of piling used tires, the ministry notes. The ministry’s initiative is ensuring a reduction of volumes of used tires and looking into the possibility of raising norms for used tire collection and recycling/regeneration in Latvia. «Application of green public procurement requirement would provide us an opportunity to use recycled materials in road construction. Multiple European countries already use recycled tire materials in construction materials such as concrete, asphalt, rail and train lines. Experts are hard at work creating a market for such recycled materials. It is important to mention that active cooperation is being performed by European countries in Europe’s innovation partnership sector, which represents a new approach for research and innovations. One example worth mentioning would be Europe’s strategy to use recycled tires for market development, which includes partners from Spain, France, Portugal, Italy and Sweden in order to develop quality products from recycled materials by 2020, as well as develop a secondary raw materials market and thereby improve EU’s competitiveness and create new jobs,» explains the ministry. The ministry also claims that to assess opportunities in relation to the possible use of materials gained from recycled tires in construction and road maintenance in Latvia, the institution will perform a situational analysis and evaluation of prior experience, including research of appropriate goods and recycled products that can be potentially harvested from recycled tires.